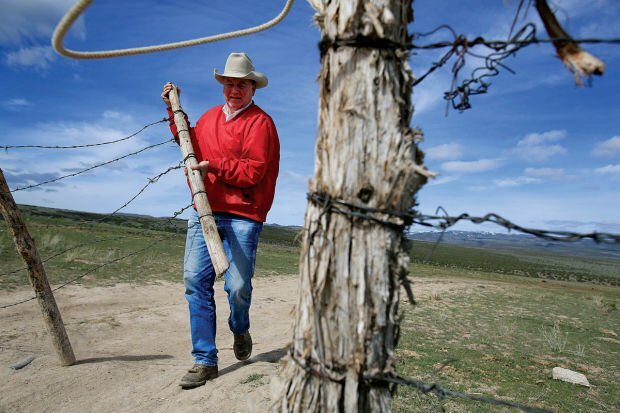 ASHLEY SMITH • TIMES-NEWS House Speaker Rep. Scott Bedke, R- Oakley, closes a fence during a tour for media on his family's ranch south of Oakley on Monday April, 29, 2013. ASHLEY SMITH • TIMES-NEWS House Speaker Rep. Scott Bedke, R- Oakley, poses for a photo next to Goose Creek Reservoir south of Oakley on Monday April, 29, 2013. OAKLEY • In Oakley, he’s just Scott. No one calls him Mr. Speaker or Speaker Bedke. There are no lobbyists lining up outside his office for 15-minute blocks of his time, no lawmakers trying to get his attention. Other than a handful of reporters who make the drive to the small town south of Burley and an occasional resident who pulls him aside to talk about issues, everyone leaves him alone. Watching him drive his Ford F150 around Oakley’s quiet streets, you wouldn’t know he was one of the most quoted men in Idaho media for the first three months of the year. A month after the close of the session, Oakley gives Speaker of the House Scott Bedke a chance to reflect on how he did during his first term as speaker — and to think about the future. Does that future include a run for higher office? Bedke hasn’t ruled it out, he said. Bedke, 55, grew up in Oakley, a town of about 760 in south central Idaho. From his house, he can see the area where his great grandfather settled. As he drove through town Monday, he pointed to the house where his mother lives, the building where he attended elementary school and the block where his grandmother’s home used to be. Like his grandfather and father, Bedke is a rancher. He works with his cousin, brother and youngest son to run the family’s heifer and calf operation. During the legislative session, he turns the operation over to them. As he pulled up to one herd of bulls on Monday, he pointed to a small Horned Hereford standing among the Red and Black Anguses. “That’s Eddie Lodge,” he said. The bull is named after Sen. Patti Anne Lodge’s husband. The Lodges sold the little bull to Bedke, and he named it after the Huston, Idaho, senator’s husband. He also has heifers he bought from fellow rancher Sen. Bert Brackett, R-Rogerson. As he drives from field to field, he wears his Bluetooth headset around his neck, keeping him constantly in contact with his secretary, lobbyists, reporters and other lawmakers. 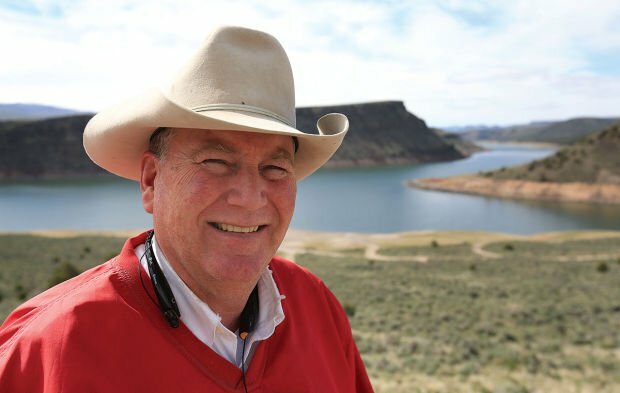 He answers the phone while driving among the heifers and calves, and switches seamlessly between talk about the cattle industry, insight on the Legislature and Oakley history. Still, he said, life hasn’t changed much in the five months since he became speaker. There are more invitations to attend events, both in and out of state, and increased media queries. But otherwise, his days are still filled with meetings, checking on cattle and watering fields, just like before. More changes may show up over the next year, before Bedke faces another vote from his caucus on whether they want to keep him as speaker. Former Idaho House Speaker Bruce Newcomb, who served from 1998 to 2006, said being speaker comes with additional responsibilities he didn’t expect. There are plenty of administrative and financial tasks, such as approving travel or expenses, that the Speaker is in charge of, Newcomb said. Former House Speaker and current U.S. Representative Mike Simpson agreed. On Monday, Bedke said he’s satisfied with the way his first term went and how he did. The House dealt with a lot of difficult issues, he pointed out — almost half of the representatives were freshmen, and many of the committee chairmen were new. The divisive insurance exchange debate caused issues within the caucus. Though the bill passed, more Republicans voted against it than for it. Does that spell trouble for Bedke when he runs for speaker next year? It’s in the back of his mind, he said, but not the forefront. “It can’t be,” he said. How about after he is no longer speaker? Would he consider a run for higher office, such as for governor or Congress? “You never want to rule anything out,” he said, adding he’s not ruling it in, either. “But before I did, I would like to have my son out of college.” Bedke didn’t specify what office he’d pursue. He wouldn’t be the first Idaho House Speaker to reject retirement. Simpson went straight from being Speaker to serving his first year in U.S. Congress. Speaker Pete Cenarussa went on to serve as Idaho’s Secretary of State, and C.A. Bottolfsen eventually became governor. Simpson said a year before running for U.S. House, he wouldn’t have considered a congressional bid. He thought about running for governor until Dirk Kempthorne threw his hat in the ring, he said. For now, Bedke said he’s happy where he is. And in the meantime, two of his predecessors are impressed with the job he’s doing. “I guess if I was going to rate Scott on the job he did ... I’d say I’d give him a triple A,” Newcomb said. Simpson agreed. The speaker’s job is to represent the whole House, not just the majority party, he said. “Judging from the outside, I think that’s the way Scott operated this year, which was to his credit,” Simpson said. House Speaker Rep. Scott Bedke, R- Oakley, shows his family's ranch south of Oakley. See Friday's Times-News for the story.